Pest description and crop damage Adults are about 2-3 mm long, have eight legs, and are light tan or greenish with a dark spot on each side of the back. Mite feeding reduces plant vigor and may cause leaves to curl, turn brown, and drop prematurely, reducing yield. Spider mite feeding is accompanied by webbing on the undersides of the leaves. Biology and life history Adults overwinter around buds or in plant debris, not only on strawberries but also on a wide range of plants. Warm temperatures significantly increase spider mite activity, and the entire life cycle may be completed in as little as 5 to 7 days under warm summer conditions. Therefore, there are many overlapping generations per year. 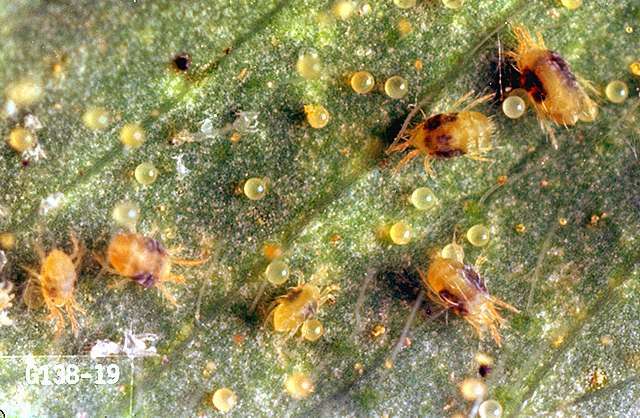 Mites do not fly but are blown from plant to plant or are carried on plant material or equipment. On individual plants, they can walk from infested to new parts of the plant. Scouting and thresholds Inspect oldest leaves first for stippling; webbing and the mites themselves can be found on the underside of leaves. Infestations early in the year, April or May, cause the most injury. If the population reaches an average of 20 to 25 mites per leaf, treatment is advisable. If the population remains low and does not rise until near or after harvest, treatment is probably not necessary. Rain and cool temperatures tend to suppress mite populations. Considerable natural control is provided by lady beetles and Minute Pirate Bugs (Orius spp.). Predator mites such as Typhlodromus spp. or Neoseiulus fallacis (syn. Amblyseius fallacis) are also effective at managing populations of spider mites and may be purchased and released. Use according to supplier's directions. Excessive nitrogen fertilization may cause population buildup. Avoid early season applications of insecticides, which reduce populations of beneficial insects. Spider mite infestations are favored by dry, dusty conditions, so avoid creating these situations and stressing the plants. Home gardeners: Mites can be hosed from plants with a strong stream of water. azadirachtin (neem oil) -Some formulations are OMRI-listed for organic use. plant-based oils like clove or garlic oil-Some formulations are OMRI-listed for organic use. abamectin (Agri-Mek and other brands) at 0.019 lb ai/a. PHI 3 days. Make two applications 7 to 10 days apart when mites first appear. Repeat this sequence of applications, if necessary, to maintain control (wait at least 21 days). Do not exceed 0.075 lb ai/a in one growing season. Do not use less than 100 gal water/a. acequinocyl (Kanemite) at 0.2 to 0.3 lb ai/a. PHI 1 day. Controls all stages of mites. bifenazate (Acramite) at 0.38 to 0.5 lb ai/a. PHI 1 day. Make two applications at least 21 days apart. Do not exceed two applications per season. Controls all motile stages, not eggs. cyflumetofen (Nealta) at 0.18 lb ai/a. PHI 1 day. Do not apply more than twice per crop season. Controls all stages of mites. Good coverage is essential for effective mite control. etoxazole (Zeal) at 0.045 to 0.135 lb ai/a. PHI 1 day. Do not apply morae than twice per crop season. Controls eggs and young mites only. fenbutatin-oxide (Vendex) at 0.75 to 1 lb ai/a. PHI 1 day. Apply in 150 to 200 gal/a. Apply when mites appear. Do not apply more than twice per year. Good coverage is essential for effective mite control. Adjust spray volume and nozzle placement to ensure coverage of top and underside of leaves. fenpyroximate (Fujimite) at 0.1 lb ai/a. PHI 1 day. Most active on mite nymphs. Do not exceed 0.2 lb ai/a per season. hexythiazox (Savey) at 0.09375 to 0.1875 lb ai/a. PHI 3 days. Controls eggs and young mites only; does not control adult mites. Do not apply more than once per crop season. pyridaben (Nexter) at 0.2 to 0.5 lb ai/a. PHI 1 day for dry formulation; 10 days for liquid formulation. spiromesifen (Oberon) at 0.2 to 0.25 lb ai/a. PHI 3 days. Controls eggs and young mites only.